Finding the right hotel in London can be an arduous task. London offers visitors the choice of thousands of hotels, from top-class boutique hotels, via large internationally branded hotels, down to budget hotels and hostels. And in each category, except the very top, there are hotels at different prices and with often considerably varying qulities. About-Britain.com helps you find the right kind of hotel for your requirements..
Below you will find a small selection of London hotels chosen for their convenience. Our choice of hotels : About-Britain.com simplifies life for visitors to London, by providing you with a short list of pre-selected hotels. No need to waste your time searching through lists of hundreds or thousands of hotels, we've done that for you. This list is short, because we've already narrowed the choice down to a short list of hotels of different categories, chosen for their convenience and location. It comprises a mix of hotels from well-known chains, and independent hotels. All hotels have been carefully selected for their proximity to the main sites and/or London Underground or suburban rail stations, and for the number of favourable reviews they have got from guests. Central area hotels are not recommended for people arriving by car. Location of hotels: clickable links below will take you directly to the hotel's own page on an online booking portal, where you can book at the best awailable online rates. Pullman London Saint Pancras. **** . 4 star hotel just opposite Kings Cross (trains for York, Edinburgh and the north-east) and Saint Pancras ( Eurostar terminal, trains for Paris and Brussels). A large modern hotel with its fitness centre. Ibis London Euston - Saint Pancras. *** . Three-star hotel next to Euston station (trains for Birmingham, Manchester, Glasgow and the north west) and 800 m from Saint Pancras ( Eurostar terminus, trains for Paris and Brussels). A typical Ibis hotel, with restaurant. 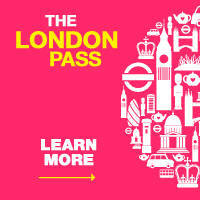 Easy access to Regent's Park, Regent Street and the West End (main shopping area of London). CHEAP Generator Hostel ** this is a low-cost student / backpacker style hostel, with rooms and dormitories. No single rooms. The hotel is reputed to be clean and convenient, but you get what you pay for. Non-smoking throughout; bar, restaurant. Shared bathrooms, free wifi. Stations, museum and West End all in youthful walking distance. CHEAP YHA St Pancras Youth hostel. Just opposite St. Pancras station, this hostel offers twin rooms or dormitories, and is open to all. 24 hour reception desk. Bar, snack bar and plenty of restaurants nearby. Adria Boutique Hotel ***** Sumptious five-star boutique hotel, in a Victorian townhouse, close to the Science Museum, the V&A and the Natural History museum. Tube stations five minutes on foot; Hyde Park 15 minutes. Public parking nearby (charge). Restaurant, fitness centre, sauna, garden. Not expensive for what it is. Holiday Inn London Mayfair **** Four star hotel right in the heart of the West End,centrally located for the famous stores on Regent Street, the National Gallery, Buckingham Palace, and a short distance from Green Park, one of London's finest parks. 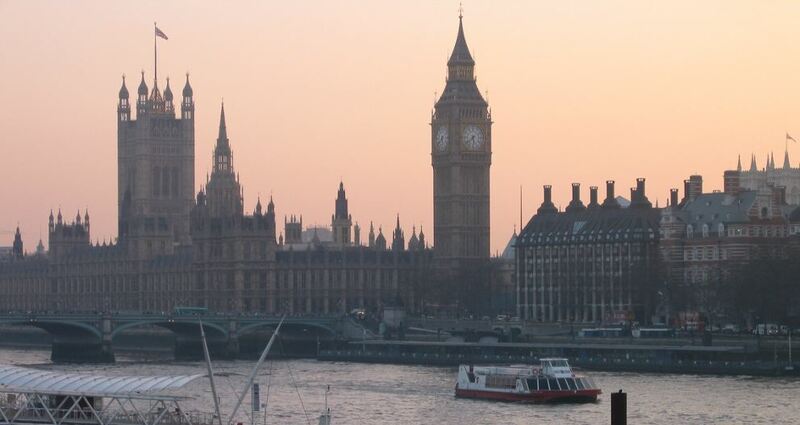 An ideal location for discovering London. London W1, near Oxford St & Regent St.
Holiday Inn Oxford Circus *** Cheaper than the Holiday Inn Mayfair, but only a mile or so distant, this Holiday Inn is well located for shopping trips to the big department stores and international branded stores of the West End. Restaurant, fitness room (not required after a day's shopping), room service, wifi in the room. Novotel London Tower Bridge **** . Four star hotel in the heart of old London, a short distance from the Tower and from the Thames and other attractions. Easy access to the financial district. Hotel with bar and restaurant. Ibis London City *** . Three star hotel on the edge of the historic City of London, near the Aldgate underground station. Easy access to all central regions by underground, bus or (for the hardy) on foot. 800 metres from Tower Bridge and the Tower of London. CHEAP YHA St Pauls Open to all, the Carter Lane youth hostel is in a quiet location in the heart of the City of London, close to Saint Paul's Cathedral. Twin, triple and quadruple rooms, or dormitory accommodation. Restaurant, laundry service. 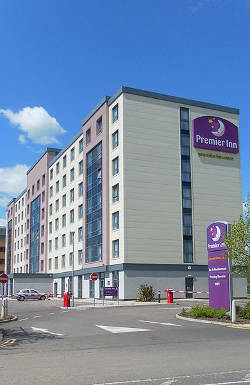 The Premier Inn County Hall hotel. *** Located in what was once the County Hall for Greater London, just across the Thames from Parliament, this three star hotel is ideally located for the national Theatre, the London Eye and other attractions. Close to Waterloo station. Restaurant, bar, reasonably priced for a central London three star hotel. Holiday Inn Express, North Greenwich *** Three star hotel in easy reach of the O2 Arena (former Millennium dome) Restaurant, bar, air-con, opening windows. good value. On-site car parking (charge). Very close to North Greenwich underground station, on the Jubilee line: trains to London Bridge in 10 minutes, to Westminster in 15 minutes. Access by A102 , just south of the Blackwall tunnel. Quality Inn, Hampstead *** Modern three star hotel with P free parking, conveniently located for access to central London (Finchley Road tube and railways stations 500 metres), and to the north of England (M1 motorway 3 miles). Free wifi. 57 ensuite rooms. The Fox and Goose hotel *** Renovated classic hotel, with traditional English pub, beer garden and restaurant. This quietly located 73-room hotel has P free car parking onsite, and is just a short walk from two underground stations, Hanger Lane (Central line) and Alperton (Piccadilly line), for frequent trains into central London. It is also just 400 metres from the A40 Western Avenue, for direct access to the M40 motorway to Oxford and Birmingham. Good reviews. Holiday Inn Bexley *** Three star hotel in outer London - south-east sector, easily accessible from Motorway for Dover. Ample car parking. 800 yards from the train station at Bexley (trains to Charing Cross, next to Trafalgar Square, in 34 minutes), for visiting London without a car. Sundridge Park Manor *** A fine suburban stately home, standing in its own grounds. Fabulous setting, P free parking. Restaurant, bar, free wifi. Recommended from Monday to Friday morning, because the hotel is heavily booked for weddings and functions over the weekend. Train station 800 yards, with trains to central London in 20 minutes. Hotel Campanile, Dartford ** Two-star hotel in outer London, just to the south of the Dartford river crossing (M25 exit 1a) . Not expensive - you get what you pay for. P Free on-site parking so you can leave your vehicle and take the train into London. Station at Stone Crossing about 1000 metres ( -> Trains to Charing Cross, beside Trafalgar Square, in 46 minutes), for visiting London without a car. Holiday Inn Sutton **** Four star hotel in the heart of the southwestern suburbs of London. Parking charge. Swimming pool, sauna etc. Less than 500m from Sutton train station (frequent direct trains to the centre of London: Victoria station in 30 minutes, London Bridge in 36 min.) Easy access to the Surrey countryside. Not recommended for travellers without a car - except on local business. Holiday Inn Express, London Watford Junction *** Reasonably-priced modern hotel, located 100 metres ffom Watford Junction train station. Non-stop fast trains to Euston in less than half an hour. Trains to Wembley in 25 minutes. Parking charge £ per day, free evenings and weekend., Access from M25 exits 19 or 20; or from M1 exit 5.
the **** Grimsdyke hotel is a hotel to remember, and good value. Built by WS Gilbert (of Gilbert and Sullivan fame), this classic Victorian mansion is a listed building with lots of character. It stands in 40 acres of grounds, with lovely gardens and plenty of free parking. Bar and restaurant. 47 rooms. Hatch End station is 5 minutes by car - free parking near the station in the residential streets north of A 410 . London has hotels for all tastes, and for all types of traveller. Generally speaking, travellers visiting London by car are strongly advised not to venture into the central area, but to book a hotel in the suburbs, where they will find parking - sometimes free. But for those who arrive by air or by train, and have no need for parking space, centrally sited hotels are the best option. The most convenient locations for tourists are the West End, or the north central area near the Eurostar terminal at Saint Pancras. For business visitors, much depends on where your business is; there are suitable hotels all over London, notably in the West End and close to the business district in the Docklands area. Top photo by Matt Geyer.